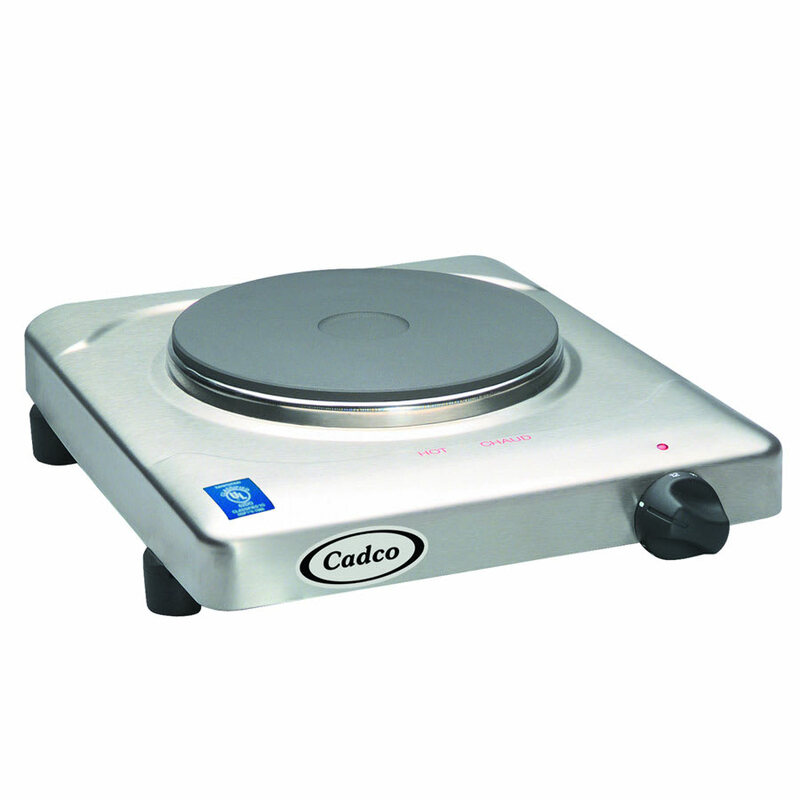 Cadco's KRS2 single burner buffet range would be ideal for any restaurant buffet or catering service. This unit is made from stainless steel and has a heavy duty 7-1/8 inch cast iron element. It has a high-tech thermostat with heating control, as well as a signal light that glows only during the heating cycle. With four non-skid feet to hold the unit in place, its surface is easy to clean. "Works well, came up to temperature real quick, cooked a pot of vegetables pronto. Nice SS top, and cast iron heat top. Made in Germany, it make..."
"Finished good, made in Germany...no sharp edges, Stainless Steel, and not made in China for a change, quality stuff, priced well"
"I just received two of these burners and I am unsuccessful in getting the water to get to a rolling boil in both of my Presto pressure cookers. O..."
"Works well, came up to temperature real quick, cooked a pot of vegetables pronto. Nice SS top, and cast iron heat top. Made in Germany, it makes a difference, the bottom edges of the SS covers ain't like a razor unfinished edge, like Chinese junk usually is. DETAILS matter. Heavy 14ga cord. Good non slip rubbery legs. Never heard of CADCO before, it looks like they makes some nice stuff. 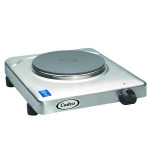 I seen $19 similar size hot plates, ya can be sure they are junk! Most reviews of them cheap ones, say they burned out fast, lousy temperature control. Sometimes ya get what ya pay for..so far so good." "I just received two of these burners and I am unsuccessful in getting the water to get to a rolling boil in both of my Presto pressure cookers. One is a smaller steel and the other is a larger aluminum. When I put the lid on the cookers it sounds like the water is starting to boil after about 1 1/2 hours but I am unsuccessful in getting the equipment up to pressure. The larger aluminum cooker got up to 5 PSI but that is not sufficient for my pressure cooker requirements. ( Also I had the PC's on the burner for about 5 hours, so there was plenty of time in my opinion to allow for sufficient heating.) I believe that to say this product is perfect for canning is misleading, I am going to try adding water that is already boiling just to see if that may help get my PC's up to proper pressure, but I believe the problem is that my PC's are too big for this product or the wattage needs to be more than 1500 to get a rolling boil in my PC's that I need. I found several other reviews saying that they were able to use pressure cookers on this product wonderfully but I seem to not have luck." "We are a tea bar and we bought it since we don't have a kitchen stove to make simple syrup with. Works great!" "Great to have for canning." "just finished a perfectly prepped passle of beans, a whole lot of beans. had this mountain of beans and hocks set at a meagre 3 out of 12 on the knob and it brewed at a nice, slow, even pace for 4 hours. it was easy and I kept dropping the setting until it just boiled lightly, so that tells you to hit the numbers early to get things brewing and in about half an hour for this pot, some 9 inches across and 10 inches deep then drop them to 3 for that slow boil to finish. no surprises and plenty of flavor." "I use this to heat up an 6.5 gallon pot and it works great"